I am mildly intolerant to wheat so I try to avoid eating it on a regular basis - annoying as I absolutely adore freshly made bread (especially sourdough) and pasta so it seems like a particularly cruel joke. It makes my stomach bloat horribly, it makes me really lethargic, and if I'm really unlucky and have been enjoying one too many wheat-y treats, it makes my joints cease up and become incredibly painful. In sort, I love it, it doesn't love me. However, a fairly recent discovery arrived in the form of spelt, a distant relation to wheat which unlike the grain we currently consume and cultivate, remains much the same as when it was first introduced here from the Middle East. And fortunately for me, it doesn't wreak havoc with my digestive system, leaving me free to enjoy my bread! 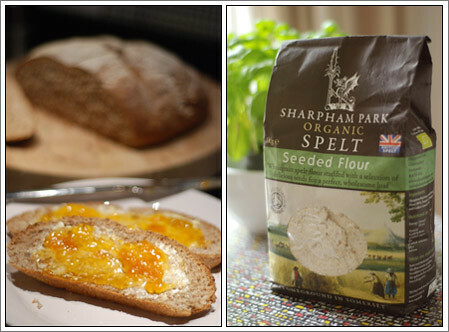 I was sent a selection of goodies from Sharpham Park (a Somerset-based organic flour mill who make a wide range of spelt products) to review, including a bag of absolutely delicious seeded spelt flour so I thought I'd better put my baking skills to the test and make my own spelt loaf. The first attempt wasn't great - I made the dough slightly too wet so it didn't quite rise as it should. The resulting loaf was a little flat with closer resemblance to soda bread than a more traditional boule. However, the taste was fantastic. Despite the flatness, it still tasted light: not heavy or stodgy in the least, and the seeds were lovely. My second attempt was rather better - I reduced the amount of water used and kept a close eye on it as it rose, which it did, beautifully. The resultant loaf was divine. 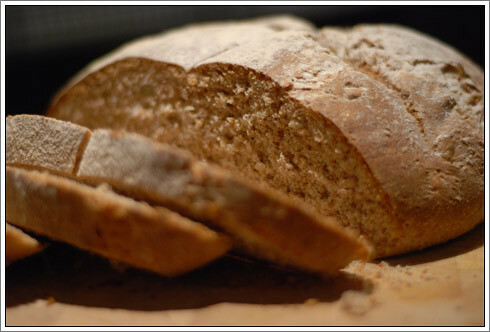 Soft, slightly tangy bread filled with a delicious assortment of seeds. It was so good, in fact, that I only got to eat one slice - my other half and sister demolished the rest. I must admit, I'm a cheat and use a KitchenAid to knead my bread, but the basics are always the same. Mix together the flour, salt and yeast, then create a well in the flour. Add the olive oil, milk and warm water and then mix together using your hands until it forms a dough. Once the mixture is doughy, transfer to a floured surface and knead for 10-15 minutes until silky and elastic, then put in a lightly oiled bowl to rise. Cover with a tea towel and leave in a warm place like an airing cupboard for an hour. After an hour, knock back and shape the dough into a ball before placing on a sheet of baking paper. Re-cover with a tea towel and leave to rise for a further hour. Shortly before the hour is up, preheat the oven to 200°C. Finally, when risen and ready to bake, dust the surface of the loaf with a little flour and then slash the top with a knife. Bake for 20-25 minutes, testing to see if it is done by tapping the bottom of the loaf. If it sounds hollow, then it's ready. Set onto a cooling rack, then when cool enough to eat, slather in butter and enjoy! I am not allowed to eat wheat and I love spelt! This sounds amazing! Will try this weekend. Thank you.